The Kenosha Public Museum is a natural sciences and fine and decorative arts museum. Established in 1933, the Museum’s collections have grown to over 80,000, including 1,200 works in the fine arts collection. Exhibit programming includes mammoths, world cultures, Native Americans, zoology, geology, fossils, and fine and decorative arts. After 65 years in a renovated post office building (now the Dinosaur Discovery Museum), the Kenosha Public Museum moved into its new facility at Kenosha’s lakefront in 2001. See the woolly mammoth excavated in Kenosha County. Stroll through the Four Season Native American Village. Enjoy world class art. Children can explore the arts and sciences in The Field Station, a popular hands-on activity area. The permanent From Curiosity to Science exhibit opened in February 2019. Take a journey of discovery from a 1600s Cabinet of Curiosity through modern museum displays to the scientific study of the natural world. Highlights include: many taxidermy animals from six different ecosystems; hundreds of specimens, artifacts and artwork from around the world; interactive games for all ages. Enjoy the gift shop, changing exhibits, and free family programs and events. Classes and workshops offered. Adult and school group tours welcomed. Facility rentals available. Parking is free; there's a parking lot and street parking. Only at the Kenosha Public Museum Gift Shop: POLISH POTTERY by Ceramika Artystyczna. First quality, hand-painted pottery in beautiful patterns, styles and shapes. Freezer, Oven, Microwave and Dishwasher Safe. As beautiful as it is durable! An ongoing program on Wednesdays: Museum Munchkins, 9:30-10 a.m. Preschoolers with an adult learn about science and the world around them. Each week explore a different topic with stories, songs, and activities using pieces from the museum's collections. Free and open to the public. Note: The Kenosha Public Museum, Civil War Museum, and Dinosaur Discovery Museum make up the Kenosha Public Museums. Travel Green Wisconsin Certified. Read about here. The Kenosha Public Museums campus is comprised of 3 museums that are open to the public. The Dinosaur Discovery Museum, the Kenosha Public Museum and the Civil War Museum. From art galleries to art museums and everything in between, Kenosha has art experiences for you to admire and to create yourself! 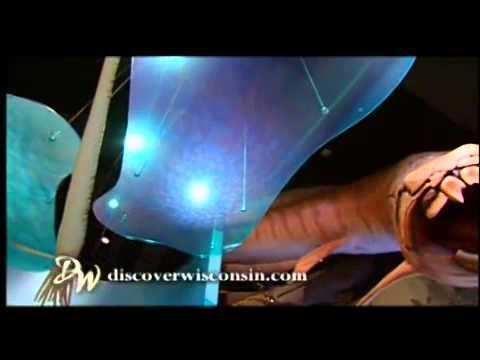 Visit the Kenosha Public Museum for natural history as well as art galleries. Mammoth bones excavated in Kenosha County are on display at the museum! Located downtown on the shore of Lake Michigan, the Kenosha Public Museum offers a variety of options for your next gathering. Scenic views, unique meeting and reception spaces, comfortable surroundings and ample parking are just a few of the amenities guests will enjoy. Be sure to take a break and explore the museum's natural history and art collections. The Daimler Chrysler Hall is ideal for gatherings and meetings of up to 200. Our spectacular lobby features a 60 ft. glass atrium and glacial till wall. The Friends Gallery mezzanine provides a spectacular panoramic view of Lake Michigan. There are also two classroom spaces which can accommodate groups of up to 60 people. Total Meeting Space: 7,455 sq. ft.
Also ask about Civil War Museum rentals!